......or width-wise. 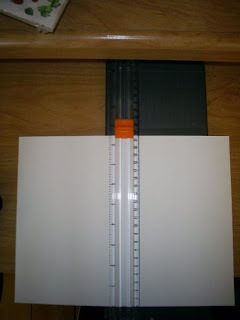 To do this I use my Fiskars cutter. 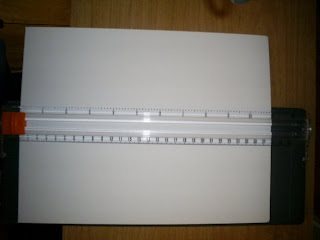 It will cut 12"x12" paper or smaller. I am just realizing now that this picture didn't turn out quite the way I wanted it to. Oopsy. ;o) So depending on how I cut the paper, my card can open 3 different ways. The first card shown has a fold at the top. The second is folded on the left side, and the last is folded at the top. 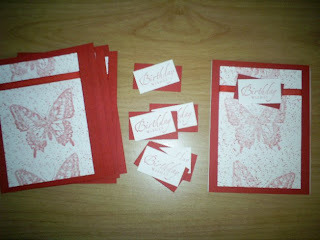 I knew I wanted a red background for this design, so I cut the red cardstock into 4.25"x5.5" pieces. 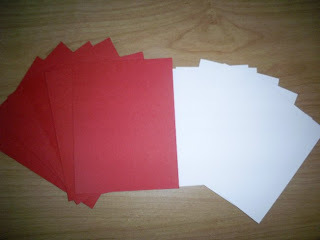 I needed to cut some white cardstock slightly smaller to place on the red background. I like to do it in steps instead of card by card. So, I do all the cutting first. 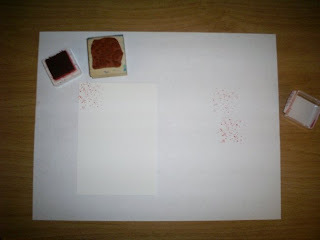 The next seep is to stamp a background onto the white cardstock. 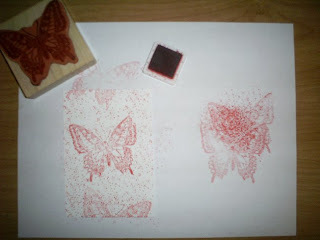 I used red ink and a 'speckle' design stamp. To make the ink a bit lighter, I stamped it in the ink and then onto scrap paper before stamping the cardstock. 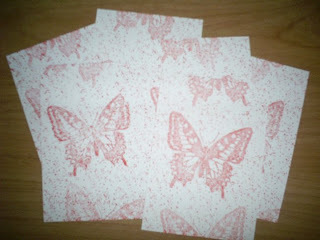 Once the background was finished, I stamped a butterfly (full ink) in the center of it. To stamp the butterfly portions at the top and bottom, the stamp was inked, stamped on scrap paper and then on to the white background. I use 'Stampin'Up!' 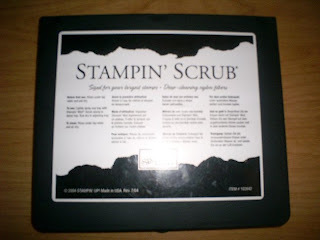 'Stampin' Scrub' to clean my stamps. This opens up and has 2 sides for cleaning. I spray one side with a cleaning solution and then I dry it on the other. For the next step, I cut coordinating red ribbon to put across the front of the card. I taped the ends to the back using double-sided tape. Then I added more tape and centered it on the red background. 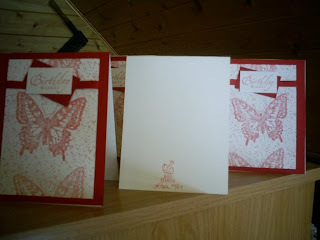 Once that step was completed, I cut white cardstock and stamped 'Happy Birthday' in red ink. I cut red cardstock to place behind it, and attached it (with double-sided tape) over the ribbon. 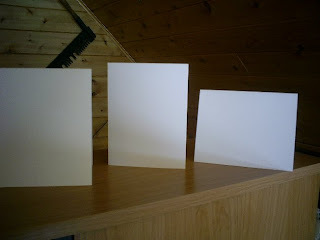 Then I attached the completed card fronts to the folded white cardstock I had cut out earlier. I stamped the back of the card with a stamp that says, "Hand stamped by" ,and added my name along with the month and year. 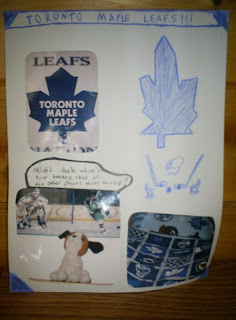 Posted by Lisa at 1:24 p.m.
That is a really neat idea to give him something to do while you have your crafting time! What a wonderful way to see things when he gets older as well! April 13, 2007 at 3:48 p.m. Cool! I'll have to share this with my daughter, she really enjoys stamping. April 13, 2007 at 5:07 p.m. Your butterfly card is very nice. 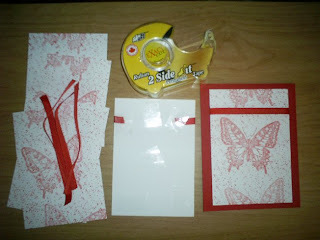 Stampin Up has the neatest products, don't they?! April 15, 2007 at 1:14 p.m. I will be back to comment on this one. There is so much I want to say. lol My free time is over though. I have deliberately not looked up Stampin Up, because I'm scared I will want to order things. You are making it SO hard. Everything turns out so nice. 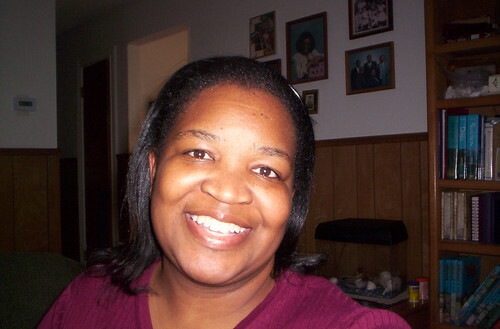 April 17, 2007 at 9:24 a.m.